Starring: Alex Cord, Arthur Kennedy, Robert Ryan, Nicoletta Machiavelli, Enzo Fiermonte, Mario Brega, and Franco Balducci. Old habits die fast in this "brutal, violent [and] intensely realistic" (Boxoffice) western about a desperate gunslinger who's hunted by the law... and haunted by the past! 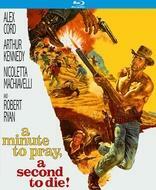 Starring Alex Cord, Arthur Kennedy and Nicoletta Machiavelli, A Minute to Pray, a Second to Die is heavily armed with "great atmosphere" (Leonard Maltin) and "shoot-'em-up action" (Variety) - from breathtaking beginning... to "explosive climax" (Boxoffice)! When Clay McCord (Cord), the fastest draw in the West, gets the shakes in his shooting arm, he decides to hang up his guns for good. But riding the straight and narrow may be more dangerous than he ever imagined - especially when his only hope for survival lies in the hands of a shady sheriff whose offer of amnesty hides something far more deadly!